EXCLUSIVE: He’s only been at the helm as manager of Leicester City Football Club since 25 October, 2017, but Claude Puel already knows that the club, owned by Vichai Srivaddhanaprabha of Thailand’s King Power Group, has a number of fans based in the country. Leicester City’s Manager Claude Puel seen here at the club’s training ground. And in a recent exclusive interview with The Phuket News, Puel said that the club will continue to give their best for them. “I learned that we have a lot of fans in Thailand and that they support us with great passion,” he said. “To them I’d like to say that we will continue to give our best for them. We want to play good football and continue to develop the team. “It’s a long process and if we can continue to enjoy their wonderful support, it can certainly help us get to where we want to be,” he added. Puel was born in Castres, France on 2 September 1961. He started his football career as a youth with Castres FC, where he was spotted by AS Monaco, joining their training centre in 1977 and spent his entire career there, playing 601 official matches in total. After ending his playing career at AS Monaco, he became manager of the club, leading them to the league title in his first full season in charge. He also managed Lille, Lyon, Nice and English Premier league side Southampton before joining Leicester. 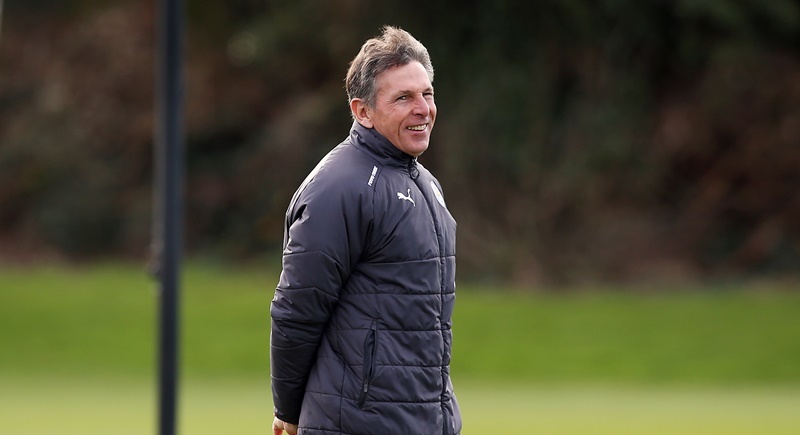 When asked how he had settled into life in East Midlands city, Puel said, “Of course it’s my first experience in Leicester and it’s important to learn. “It was a tough situation when I arrived but I had to learn quickly. Now it’s much better and the players know what it is that I want from them. So why did Puel choose to take the job at Leicester City? “I think I had a good introduction to the Premier League with Southampton and it was important to continue this work, so it was a great opportunity to come to Leicester, which is a wonderful club. “I really like the Premier League and the atmosphere around this team. For me, Leicester was perfect for me to continue in the Premier League,” Puel said. When Puel arrived in Leicester back in October last year the team was struggling defensively. Moreover, the team were 14th in the league with just two wins in their opening nine league games. Now, having played 27 games with nine games won, lost and drawn, they see themselves sitting at 8th in the 20-team table. So what does Puel see as the reason for this turnaround in performances? “I think mainly the quality of the players and their willingness to listen and learn. It gives them the opportunity to play in the team and build on the strengths we already had with even more solutions on the pitch against different systems,” Puel explained to The Phuket News. “It’s not easy to play in the Premier League, it’s very difficult, but we’ll see how we get on,” he said. But is Puel happy with the club’s current position in the league table? “For the moment it’s not crucial, we have to see where we are in the league at the end of the season – that’s important. “It would be fantastic to be seventh but we can’t look that far ahead. We have to keep our concentration on the next game. If we play good football every week, we can do well. It’s important to keep our focus to maintain these good results,” he said. Having played and managed in France for several years, but most recently having turned to England to ply his trade, what does Puel see as the main difference between football in the two countries? “It’s the atmosphere around football and the passion of the fans. “Also, it’s all the journalists and newspapers at the press conferences – there are lots in England,” he said. “For example after a game in England I will do interviews for a minimum of one hour,” he explained. “But it’s amazing and it is a good thing,” he added. “Also, on the pitch there is more quality in the play because the world’s best players come to the Premier League. “Furthermore, there are differences in France because sometimes in England they don’t give a foul when in France it would be. Also, in the Premier League set pieces and corners are very important, more so than in France,” he said.